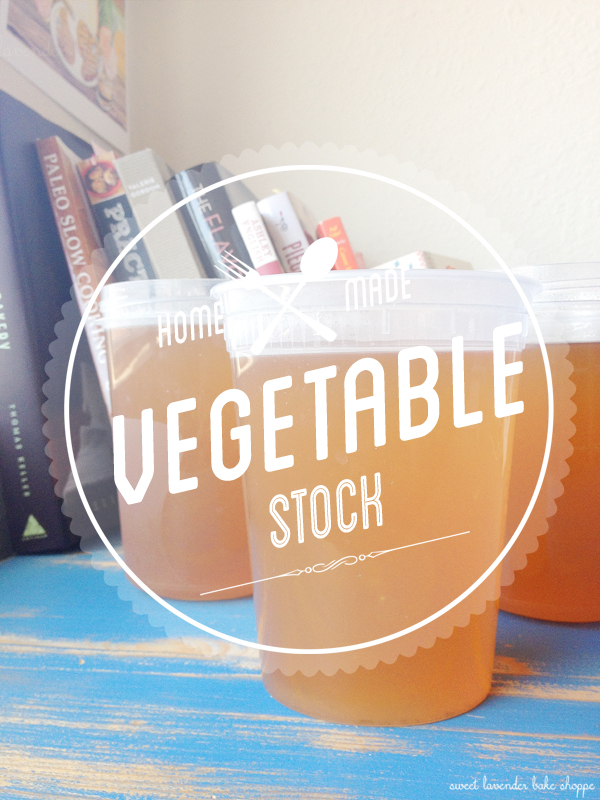 This is my number one go-to for veggie stock making. It is SUCH a money saver AND makes my family stock that is 100% good for you, natural, and that I know the ingredients of. In the Main house, we go through stock pretty quickly. Whether it's used in soups or chilis or used to cook rice, quinoa or couscous, we use it throughout the week, every week. Read the labels of those store-bought stocks, friends. You'll be surprised. I recently bought an organic and free range brand named chicken stock and mistakingly brought it home without first checking the label. Everything was great until I read, "natural chicken flavorings". Ummm, what? What does that mean? It said, "chicken" as well... so I know that's not what they meant. Blarg. Making this is super simple: all I do is keep a gallon sized ziplock freezer bag in my freezer and place any and all washed vegetable and fresh herb trimmings into it while making dinners for a few weeks. This literally only takes a week or two of saving the trimmings. Carrot tops and peels, onion and garlic skins, parsley and cilantro stems, bell pepper insides, sweet potato ends, etc...if it's "trash", it goes into my freezer bag. Then, after a few weeks my bag is packed full! Stock time! Then all you do is add your frozen bag to a large pot of water and simmer away! Easy right? You'll also notice that there is no salt added in this recipe. I was taught that when making stock, salt is a no-no. It's better to have a salt-free stock that can be added to any recipe needed and season accordingly thereafter. So, it's what I always do. 1. In a 6 quart stockpot add your bag of frozen vegetable and herb trimmings. Add in your bay leaves, peppercorns and filtered water and bring to a boil. 2. Once boiling, turn heat down so that you have a simmer and allow to cook, uncovered 45 minutes to an hour. 3. Strain stock from vegetables and herbs and then carefully pour the liquid into heat resistant and freezer proof air tight containers. Remember to leave enough room in your containers for stock to expand when freezing. Allow to cool uncovered in those containers on your counter for about an hour. 4. Secure containers with lids and store in fridge for up to a week and in the freezer for months. I try and keep a quart in my fridge always. You never know when you'll need fresh stock! Once that has been used up, I grab another quart from the freezer and place in my fridge to defrost. This can take up to two days to thaw completely. Homemade, unprocessed and glorious stock goodness. Yum to the O! This is a great idea! 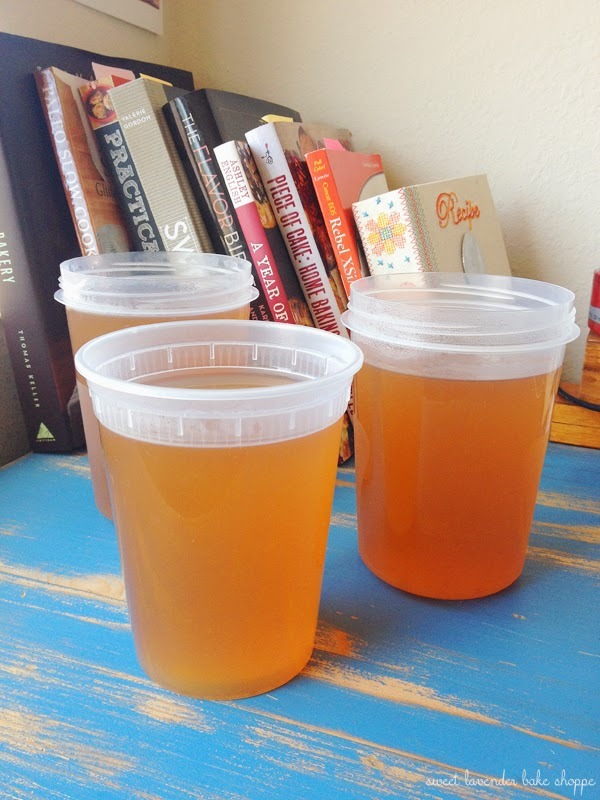 I've made homemade chicken broth, but I've never made vegetable broth because all the recipes I've seen used a ton of fresh veggies (and that's so expensive) - but I can definitely recycle all my veggie scraps! Okay, I never thought about keeping a bag of the veggies in the freezer and adding to it till it's full. You are brilliant girl!! Totally going to start that today! Oh, let me know how it goes! I am making this now! Where do you get the containers that you put your stock in? I live in a small mississippi town and couldnt find them at Walmart or Kroger! :( Help! Oh no! Hmmm, you might want to try Target or else I'd just buy some off of Amazon.com.